Dr. Virginia Parks and Jawanza Malone join in a conversation about the usefulness of CBAs for local communities. Speaking at the University on Monday, the head of the Kenwood Oakland Community Organization (KOCO) said that without a community benefits agreement (CBA) for the Obama Presidential Center, current residents will inevitably be displaced. 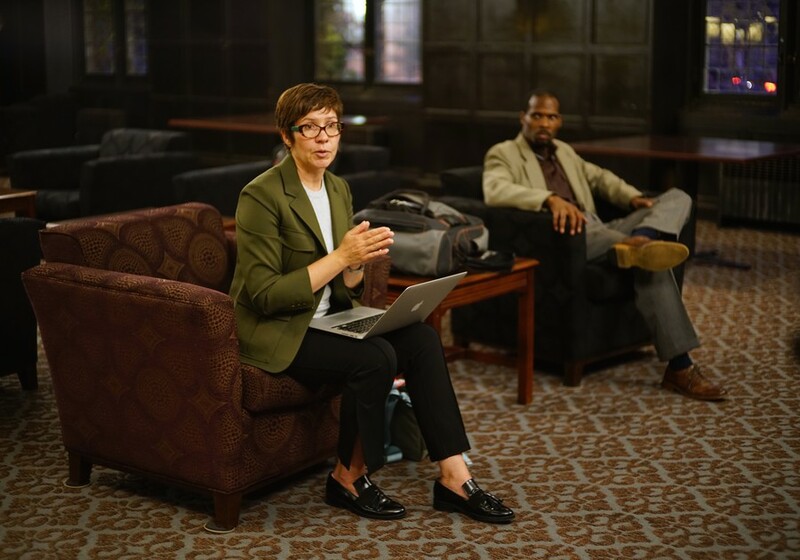 KOCO Executive Director Jawanza Malone spoke alongside Virginia Parks, a professor at the University of California, Irvine who specializes in urban planning, labor issues, and the history of CBAs nationwide. Both speakers were hosted by student group UChicago for a CBA (formerly the Prayer and Action Collective) at a dinner talk in Reynolds Club. UChicago for a CBA is part of a broader coalition of community organizations pushing for a CBA. Parks gave a history of past agreements, emphasizing that although about 50 have been created since 2001, she only considers 15–18 of those to be “strong CBAs,” based on criteria including public availability and the distribution of the benefits beyond the groups that signed the CBA. At a meeting with community organizations last month, former president Barack Obama stated that a CBA does not suit the Center because the Obama Foundation is a nonprofit already working for the benefit of South Side residents, and because signing a CBA with only certain groups would suggest that they represent the South Side as a whole. Parks explained that CBAs come from a tradition of labor and environmental agreements which aim to protect certain groups from being unfairly taken advantage of. She said that strong CBAs are written to ensure that the benefits of the relevant development projects go beyond the groups that drafted the CBAs. According to Parks, the groups that negotiate CBAs are generally doing so on behalf of communities which will be directly affected by major development projects, but are also ensuring that the benefits are shared with the public. For example, the Staples Center CBA written in 2001 requires that the project’s developers hire a certain percentage of long-term employees from the surrounding neighborhoods and from low-income neighborhoods across L.A., she said. “Even if we recognize that there might be some actors that benefit more greatly [from projects], we want to make sure that, at the very least, there aren’t negative effects that fall disproportionately on certain communities,” Parks said. Malone gave additional reasons why a CBA for the Obama library would be beneficial. He noted that UChicago—which submitted the proposal for a Jackson Park Obama library—stands to profit significantly from the library’s development. He also cited the University’s recent announcement of its plans to build a conference center and for-profit hotel near the Center and pointed out that the University owns much of the real estate surrounding the Center’s future site. According to Malone, property values in Jackson Park and Woodlawn have risen 13 percent and 23 percent respectively this year. He credits this surge of development to speculation connected to the Center. Malone responded to a CBA criticism expressed by Obama and Hyde Park Alderman Leslie Hairston, which claims that community groups should not constrain the potential benefits of the Center with a written agreement. Fourth-year Robert Hayes, a member of UChicago for a CBA, outlined the group’s upcoming plans in an e-mail to The Maroon. “We'll be attending Alderman Leslie Hairston’s next ward night on October 24 to continue to press for her support,” he wrote. Hayes added that UChicago for a CBA will also go door-to-door in the Fifth Ward to ask residents to sign postcards to the Alderman. He stated that the group has already given Hairston 300 signed postcards and aims to deliver 1,000 in total.